Back-to-school is an exciting time of year, but can also be a stressful one for parents & kids alike adjusting to the post-summer routine. Lunches shouldn’t be a source of stress, & can even be jam packed with foods to nourish the brains & bodies of your kids! 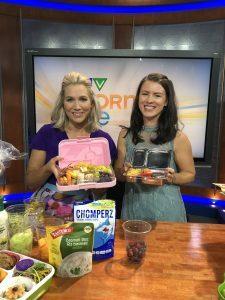 This morning I was on CTV Morning Live sharing some tips & tricks in partnership with Blush Lane & Spud! The origin of the bento box is in ancient times in Japan. At that time, lunches were wrapped using such materials as oak leaf, magnolia leaf, bamboo leaf, and bamboo sheath. Later, wooden boxes came into use. Modern bento boxes that you can find at local stores like Blush Lane or online through Amazon are made of a variety of materials, including wood, metals such as anodized aluminum, & plastic. THOUGHTFUL MEAL PREP: Having a bento box or a container you can section off for different food group, can help with thoughtful food choices & portions. PICKY EATER HELP: It takes presenting & tasting food up to or more than 15 times for kids to decide if they like the food, & understand the taste. 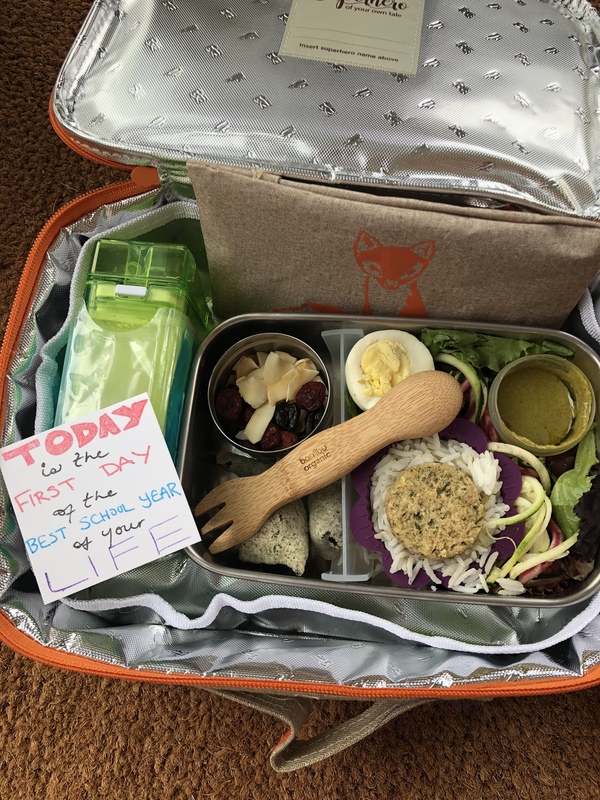 Bento boxes offer parents the chance to include small amounts of new foods to children regularly without significant food waste is said food isn’t loved! 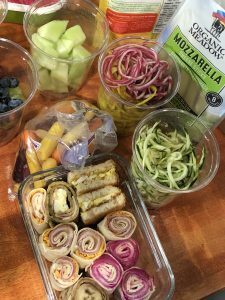 BACK TO SCHOOL NOT BACK TO BORING LUNCHES: The thought you put into lunch prep ensures your kid’s lunch will never be boring if you mix & match foods to create fun & healthy bento-box combos for school. MAKE IT MINDFUL: Mindful eating includes grocery shopping & meal prep, not just the meals. Shop online or in store for your convenience! MEAL PREP: Dedicate time on Sundays to wash and prep vegetables & fruit, to prepare sandwiches & grains, then separate out into reusable food containers that you can draw from as you create bento boxes each night or morning. GET PLAYFUL: Being a parent means there are lots of to dos on your plate. Why not have fun and be mindful during those activities that you have to do? Making bento boxes for my kids is part of my mindful meal prep, & a way to present them with small amounts of new foods they can choose whether or not to try on their terms at school. 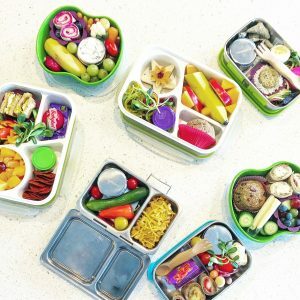 You can add play into the prep & the presentation by listening to a favourite playlist while you whip up the bento boxes, using silicone cups with pops of colour, cutting food into fun shapes with cookie cutters or spiralizing vegetables. BE MINDFUL OF THE FOOD GROUPS: If the bento box seems like a puzzle, keep in mind different food groups you can have in each lunch: grains or pseudo-grains, protein (such as meat & beans), fruits, veggies. Dietary variety is one of the core principles of nutrition. Have fun with your food choices. Mix it up! TAKE IT EASY: If you know you’re short on time, you can get precut fruits & veggies from Spud & Blush Lane. GET THE PORTIONS RIGHT: Bento boxes come in a range of sizes. Buy one that holds the amount your child usually eats for lunch at home. Or go a little larger so your child can eat their morning and afternoon snack out of the bento too. PRACTICE AT HOME: Serve lunch in the bento box for a week before school starts. That way, your child will get experience opening and closing the box. It will also give you a better sense of how much they’ll eat. VISUAL PRESENTATION IS KEY: Let your kids (& yourselves) feast with the eyes. The prepare. To ensure that the food will make a good overall impression when the eater opens the lid, the preparer should choose an attractively colored assortment of foods & arrange them in a way that looks appetizing. ELIST THE HELP OF YOUR KIDS: When talking raising mindful eaters, it’s key to get your child involved in food selection & meal preparation. This also helps with a parent’s lunch work load! Take your child grocery shopping online or in stores & encourage them to try produce they want to try. Try to make a habit of trying one different food per week as a family. Allow your child to wash produce & other chores to help out in prep. PACK IT IN: The most important thing to remember when packing a bento is that you need to fill the box completely. If you don’t pack the food in snugly & right up to the top rim of the box, everything will mix together & the little bit of extra time you spent to make the lunch cute will have been wasted. I usually pack the main components into the box & then look for any extra spaces. If I find any, I plug them up with smaller little bites. Grapes, cubes of cheese, berries & cherry tomatoes are wonderful for filling these little gaps. Looking for some ways to prep boxes when tight on time or money? Not sure you want to commit to purchasing a high quality, BPA-free bento box? Go to a local kitchen or craft stores to buy colourful silicone muffin/cupcake cups to both add a pop of colour & create dividers in your containers if you aren’t using a bento box. Stretch supper into the next day with leftover chicken, meatballs, veggie patties, pasta, rice, cooked veggies etc. prepared veggies such as carrots, mini cucumbers, & spiralized beets or zucchini. [Spud.ca or Blush Lane stores have these available for online or in store purchase]. Use microwave rice which takes all of 90 seconds!